The art around Eastern Market is worthy of stopping for a picture. We’re excited to announce that The Michigan Pedaler now offers tours through Eastern Market. This becomes a fourth option of where you can visit while riding Detroit’s Party Bike. 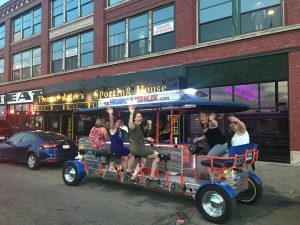 Since our inception, we have been the leader of pedal pub companies (#FunDoneRight) by being the first to offer three distinct tours through Downtown (which includes Campus Martius, Greektown, and the stadium district), Corktown and Midtown. Now, we are excited to be the only company to offer regular tours through Eastern Market too. 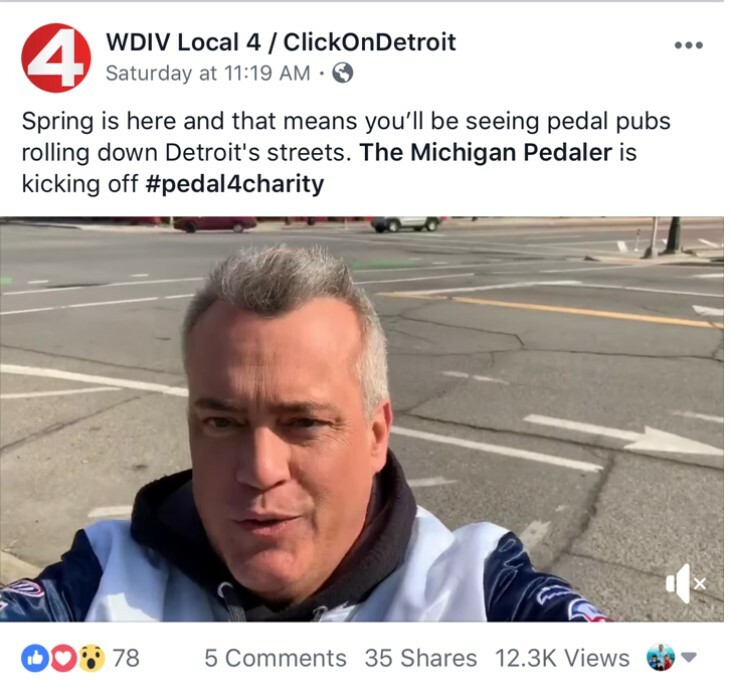 The Michigan Pedaler offers tours through Eastern Market. Why did we expand our offerings? It all started very organically. Yes, we have ventured into Eastern Market to celebrate a Lions tailgate, but one of our drivers came to us with an idea that was bigger — explaining potential routes, places we could visit and how to incorporate it into our typical customer-oriented, customized, Michigan Pedaler Experience. Our team started investigating the possibilities and determined the idea had verifiable legs. The Michigan Pedaler Eastern Market Tour will incorporate a few things. First and foremost, it is a chance to see Eastern Market and the businesses that thrive around it. If you happen to be around when there is activity in the sheds, that is fun to see. But even on days in which farmers are not bringing their goods to sell in the sheds of Eastern Market, there are plenty of other things to witness or do. The area around the sheds are like a small town. Mom and pop stores, produce markets, meat markets and warehouses make up Eastern Market. For the better part of two decades, I personally have enjoyed walking or biking through Eastern Market on a weekend or weekday and seeing what’s going on. There’s a great wine and cheese shop, a place that sells candy in bulk, nuts and popcorn. There’s a bike shop, a pizza place, an old Italian joint, and many places that sell fruits, vegetables, meat and knick-knacks. Even if you don’t have a nickel in your pocket, poking around these stores is a lot of fun. But this is more than just seeing the sights and smells of the shops. In recent years, Eastern Market has become a bright and lively expanse of murals, drawings and graffiti art. 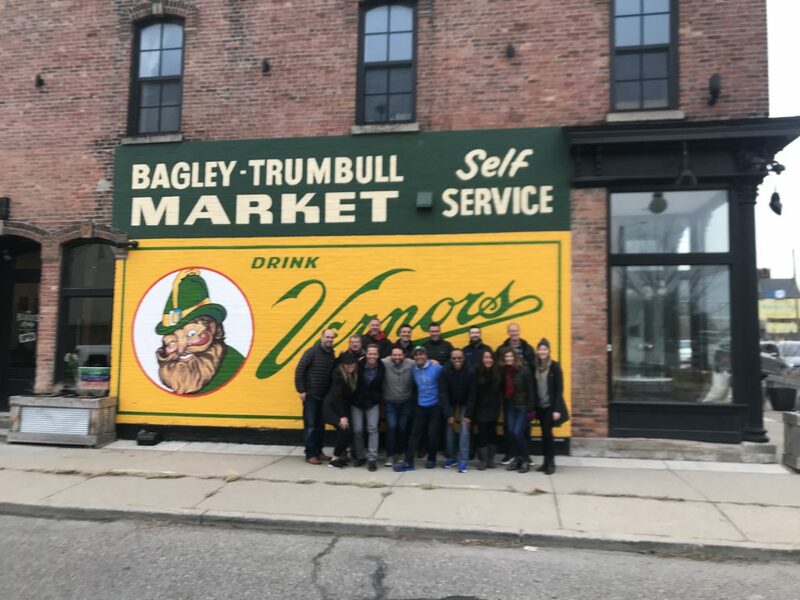 A group of Pedaler riders stop for a picture in front of this lively mural. The long walls of buildings that once were nothing more than bricks or paint now house colorful depictions of life. While doing our Eastern Market rides, we’ll often stop for a moment to allow our group to take pictures of these. In addition, we’ll often stop for a group photo in front of one of them. One of Eastern Market’s favorite hangouts is Thomas Magee’s Sporting House and Whiskey Bar. What better a place to take a break from pedaling than to indulge yourself in a beverage or two than at this local pub? The owner, Erik Olson, takes great pride in his establishment and putting the word “Sports” in its name is more than just a marketing ploy. Soccer fans often descend upon Magee’s to catch the latest European matches, packing the place and cheering loudly for their teams while immersed in their team colors. Magee’s enjoys a reputation around town as the place to go for soccer fans. But the bar is much more than just a soccer place and enjoys a a word-on-the-street reputaton as a perfect place to meet up with friends or colleagues for a pint or drink. Thomas Magee’s Sporting House is an Eastern Market pub that is the perfect place to take a break while pedaling through Eastern Market on The Michigan Pedaler. The tours to Eastern Market also offer our guests a chance to see a few other things as they make their way to the destination. 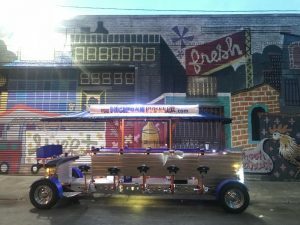 Since we debuted this ride and began testing it a few weeks ago, we often take people through Greektown on the way to Eastern Market or visit Comerica Park for a picture by the “big Tiger” on the way back. 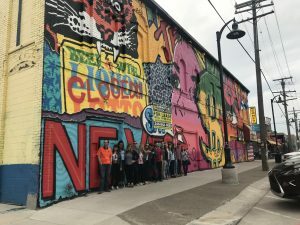 Another option is to visit is Brush Park, which is located just north of Comerica Park. This is an area that we are watching evolve before our very own eyes over the course of our three summers in existence. Check out a future blog about more details of this area coming back to life. Is the Eastern Market Tour the right one for your group? We are confident in saying that regardless of what tour you select, your group will have a great time. Each tour is different. Each tour has its own appeal. The best thing to do is come on out, select one, and have a great time while exploring our great city.